Today's So Shoe Me is the Big Top by Irregular Choice, $270, available at Solestruck. 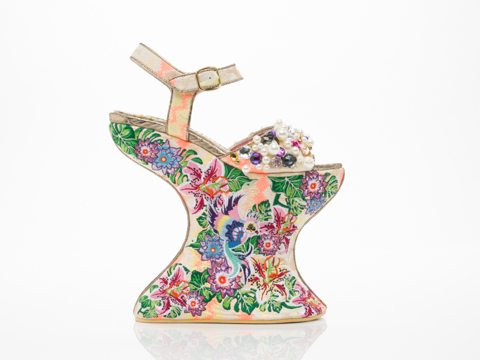 Flowers, birds and pastel pearls create a whimsical wedge that will add a colorful edge to your springtime style. This garden party heel is given the Gaga treatment with a curved sky high wedge for a signature silhouette. The 8" heel and 6" wedge make these a standout style that will turn heads throughout the season. Perfect for your next party, pair these lovely embroidered heels with a 3D floral halter top and distressed denim skirt for a casual and chic way to wear these over-the-top shoes. So Shoe Me a pair of whimsical wedges that will add a floral fantasy and an outrageous silhouette to my springtime wardrobe.